When formed in 1923, the Southern Railway inherited an interesting ‘’Light Railway’’ branch line across the Isle of Sheppey, which terminated at the potential seaside resort of Leysdown-on-Sea. Engineered by Holman Stephens (notable for his work on the Kent & East Sussex Light Railway), the line became a loss-making venture, but the SR decided to perpetuate with the branch during its tenure, in the hope that Leysdown became popular with holidaymakers. It would appear to be this very same optimism which provided the necessary impetus for a similarly-speculative passenger branch on the adjacent Hoo Peninsula. Indeed, the route from Hoo Junction to Grain already boasted a passenger service, but by no means was this a holiday line, it merely being the remnants of the SER’s attempt to challenge the LC&DR’s continental boat traffic in North Kent. The bleak line across extensive marshland had fully opened to Port Victoria on 11th September 1882, Cliffe and Sharnal Street being commissioned as the only intermediate stations. The latter had acted as a terminus since 1st April, before services were able to reach the Isle of Grain. The SE&CR made its mark with the opening of no less than five halts along the line in 1906, in addition to abandoning the original Port Victoria pier ten years later – now it was the SR’s turn. Allhallows was a non-descript area, consisting to the south of marshland as far as the eye could see, whilst to its north was the Thames estuary. Transforming it into a popular seaside town would indeed be a task, but in light of Greenwich once being popular with seaside-goers travelling by rail (a number of sandy beaches residing at the side of the Thames there), then perhaps this task was not insurmountable. However, Allhallows-on-Sea had much ground to make up on Kent’s flagship beaches of Victorian resorts Margate and Broadstairs – could passengers be swayed by the mud of the Hoo Peninsula? The SR at least thought so, as did property developers, and before the 1920s had been seen out, formation of a 1¾ mile-long track bed to the bleak outpost had begun. The line was to be single-track in nature, as per the whole route from the North Kent Line, and branch off at what would become ‘’Stoke Junction’’, which resided some 1⅓ miles west of Grain Crossing. At the junction, the Allhallows line was to curve sharply northwards, keeping the track bed west of Yantlet Creek, which separates the Isle of Grain from the mainland. Opening day of the Allhallows-on-Sea line was 14th May 1932, the route terminating at a station of typical SR character. Positioned over 400 yards from the ‘’beach’’, the site was merely a single-platform affair from the outset. Naturally, the platform surface was constituted of standardised prefabricated concrete components manufactured at Exmouth Junction works. The station building, of a somewhat clinical design, was also of concrete construction, being single-storey in nature and demonstrating two pitched roof sections (one considerably larger than the other). It was positioned at the northern end of the platform surface, but rather than being end-on to the terminating tracks, was instead parallel with them. Attached to its platform-facing façade was an upward slanting plain valance canopy. Again, this was a standardised design, and identical examples prevailed at the rebuilt Bexleyheath, Welling, and Eltham Well Hall stations in 1931. Thankfully, the examples at the former two are still in existence, Well Hall station having been abolished in the 1985 A2 Trunk Road realignment programme. At Allhallows, immediately adjacent to the station building’s southern elevation, was a quite charming signal box. Although erected by the SR, it clearly derived its design from those Saxby & Farmer-built signal cabins which emerged before 1900. Positioned upon the platform, it lacked any form of brick base, the lever frame residing at ground level. Of all timber construction, its appearance can be paralleled with the upper half of the signal box still in use at Sturry, despite the latter being of much older origin. The signalman had a fairly basic layout to control, which comprised the platform line, the customary run-a-round loop, and a southward-facing siding which terminated behind the platform surface. However, it was not long before this arrangement was improved upon. By the end of the first year, 6,500 people had been carried to Allhallows-on-Sea – a promising start. Perhaps these were just curious spectators, for the line was ultimately unable to build on this early success and carry increased traffic loads in ensuing years. However, the passenger numbers dealt with thus far were enough to keep alive the SR’s optimism, and for the line’s first full year of operation – 1933 – changes were afoot. These began with the station layout: the existing concrete platform surface was extended at its southern end, and an additional platform face brought into use, bringing the total to two. This provided a terminating island platform arrangement, akin to that still in use at Hayes. The opportunity presented itself to the SR to incorporate yet another standardised architectural design: a wholly separate canopy extension was brought into use, providing much improved protection from the elements. This was of the now familiar W-shaped design, which had appeared at the rebuilt Hayes in the same year, and latterly at the transformed Tonbridge and Swanley stations in 1935. For the incorporation of this structure, some interesting modifications were made to the platform-located signal box. The quaint cabin lost its pitched roof and instead, witnessed its timber sides extended above the window lines to meet the steel under-hang of the platform canopy. Lengthening of the structure also took place. The signal box now controlled a layout which had been subject to noticeable revision. Crucially, the two platform lines were each accompanied with their own run-a-round loop, and the goods yard had by now taken shape. The latter consisted of a lengthy southward-facing siding which terminated on the eastern side of the layout. It was joined in the freight handling capacity by an extension of the adjacent run-a-round loop. A typical feature of a terminus arrangement, a turntable was provided at the southern extremity of the layout, to the east of the running lines. Interestingly, however, no overnight engine stabling shed was established at Allhallows, this once being a familiar characteristic of branch line termini. Nevertheless, the essentials were catered for, and at the very end of the concrete platform surface emerged a cylindrical pitched-roof water tower. Of importance, but not yet touched upon, is the branch line’s doubling in 1934, which was a follow on to the aforementioned station alterations. This upgrade just affected the 1¾-mile Allhallows spur, and not the entire route from Hoo Junction. Whilst both World Wars had provided the Grain branch with considerable freight flows, and the inception of the Anglo-Iranian oil refinery had only compounded the route’s success in the goods handling capacity, Allhallows passenger traffic had been floundering. 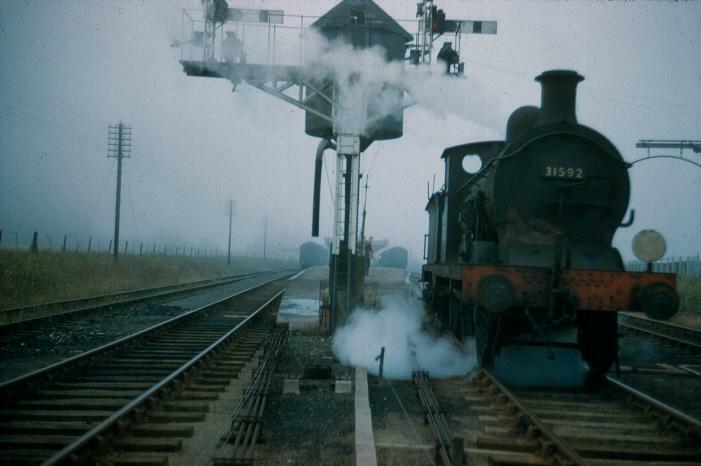 Shortly after doubling the spur, the SR had set sights on doubling the entire route from Hoo Junction, following this course of action with electrification. Intervention of World War II, combined with poor receipts, rendered such proposals as obsolete. The branch would, however, last beyond that on Sheppey. 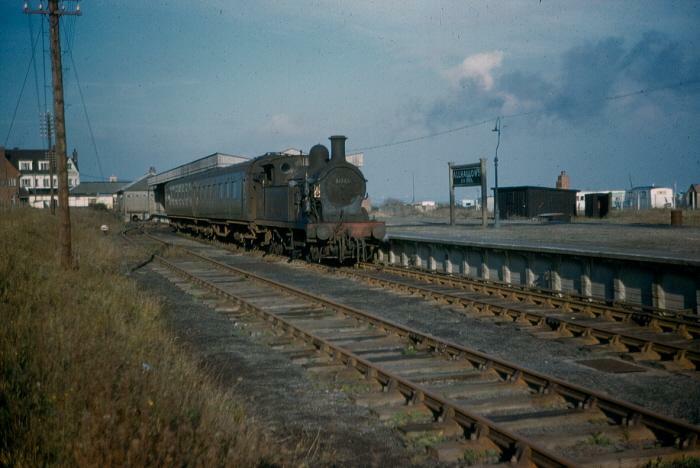 The 1948-formed British Railways was fairly swift in closing Holman Stephens' 8¾-mile long Light Railway from Queenborough, the route going out of use on 4th December 1950 after a life of less than fifty years. The Allhallows line, despite also being a loss-making appendix, was given a stay of execution. The fact that it was a short spur, of under two miles, off a now important freight route, justified its existence – at least for now. Most Gravesend shuttle services had since been diverted to Allhallows; under BR, the line beyond Stoke Junction, to Grain, enjoyed just two push-pull services a day. 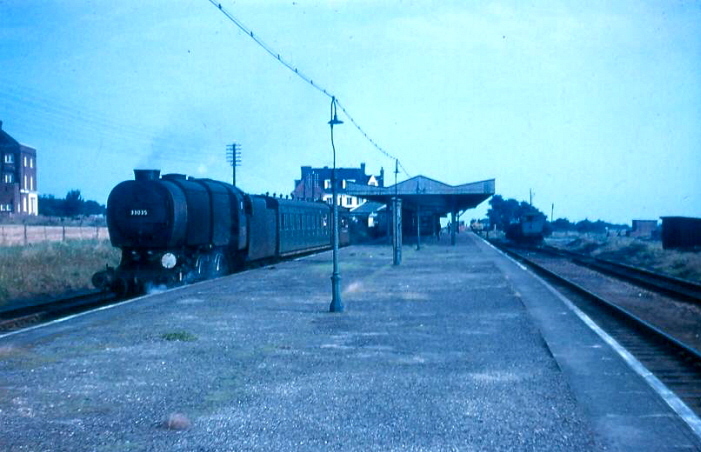 Significant degrading began with the singling of the Allhallows spur in 1957, but the terminus station layout was not subject to similar economies, all sidings and facilities remaining intact. The short branch was not to stave off closure, however, and on 3rd December 1961, the entire line across the Hoo Peninsula witnessed its final passenger service: the push-pull shuttle from Gravesend Central was now no more. The aspirations of the original Allhallows property developers were seemingly doomed, and the oil refinery’s Grain terminus had experienced a short working life of just ten years. Demolition and redevelopment of the Allhallows station site was undertaken piecemeal over the course of more than two decades, the area eventually being transformed into a countryside park. The area had finally acquired some significant residential development; by this time the railway was long gone.